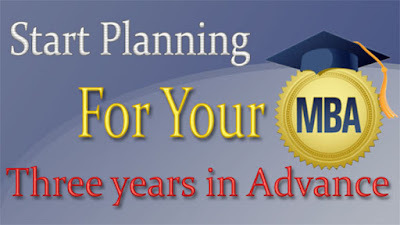 Start Planning for Your MBA Now! HomeMBAStart Planning for Your MBA Now! If you are just in the third semester of your BBA program then you might not have even thought about what to do after your BBA. However, I assume that you have already thought about it. I further assume that many of you will be doing MBA, and as far as possible, from a reputed university. Okay, if that is the case then it's high time you planned for your MBA now. I'm really serious and in no way, joking. The time for you to start planning for your MBA has already begun, especially if you want your study to be regular, without any gap in between BBA and MBA. However, if that's not the case, you might just chill and relax as of yet. Why am I calling you to plan for your MBA now? From my preliminary research, I have come to know that MBA is crazy expensive and if you wish to complete it from a reputed college or university of the USA, you'll need two years working experience. Sure enough, these two pieces of information are worth pondering upon for the ambitious scholars. That's why I am trying to draw your attention on this regard so soon. I am right now in the third semester and the need to plan has already hit me hard. Because you can't get a decent job, which will qualify you for your MBA, within a brink of your eyes, I should allow myself plenty of time for it. The first task would start by searching for the universities where I might choose to pursue MBA and see their application criteria and know what kind of work experience is acceptable (or necessary) for it. Then I might have to seek out the businesses which can provide such jobs. I might want to apply for the internship first to get knowledge and experience in the field. And then only comes the job application process, which itself is time consuming. So, there's so much to do, and if I don't start planning right now, do you see any chances that I will succeed? No way. And the same rule applies to you and anyone else who are eager to pursue Masters of Business Administration degree from a reputed university abroad. Also, it is wise to understand that it is never too early to begin something. There will be a lot of obstacles to tackle on the way. So, it's not too early now to begin planning for an MBA. Similarly, we should also take into account the expensiveness of the program. Expensiveness means more money and more money means planning too. If you don't plan how to finance yourself, I am sure you'll have no sources to finance your education. If you start from now onward to earn seriously, then probably you might be able to earn the necessary money yourself. If you are thinking to ask your parents for it, then too they will need some time to collect some huge amount of money. If you are considering student loan, then you might want to see the procedures and the requirements they need. I am sure they won't be providing you the money without considering whether you can repay it with interest. Therefore, planning is quite necessary for MBA and if you are really ambitious, you should start planning right from today. As of now, it is neither too early, nor too late. However, if you don't take it seriously, it'll be too late soon.